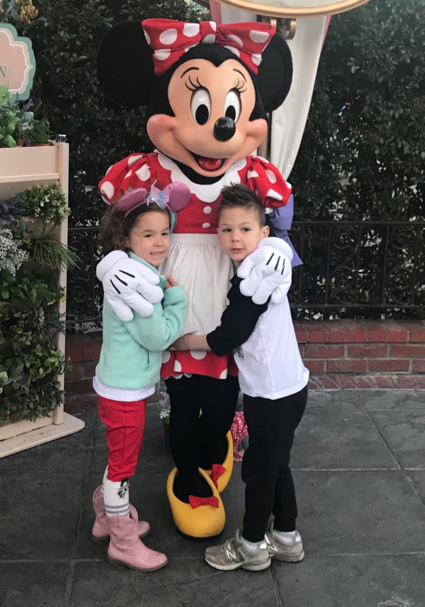 The big day officially arrives – grand twins turn 5 | Who Da Thunk? The twins’ 5th birthday celebration got off to an early start with a character breakfast at the Plaza Inn (another flashback from the past as it’s been there as long as the Adventurers remember although neither recall ever being inside. Minnie was outside to great the celebrants. Then it was hit the rides, beginning with Pirates of the Caribbean. It was there that L had to strike a deal with Lily, who was a reluctant rider. If Lily would go on Pirates, L would go on Small World. Lily was up to the challenge. And yes, Small World was as awful as ever but at least colorful. Other rides include the Matterhorn, Star Tours, Thunder Mountain, and Haunted House -most of which would test the mettle of many 5 year old but not the Tiki Twin! Lunch was at a Tiki place (natch) next to the Enchanted Tiki Room (which the Adventurers managed to avoid experiencing this trip – enough with the birds). With the twins off for a birthday nap, the Adventurers took in some oldie but goodies like the Jungle Cruise (same dialogue!) and the Mark Twain paddle wheel where they could see what was once Tom Sawyer’s island turned more into pirate hideaway. When they arrived at their FastPass entry to Indiana Jones, they learned the ride was closed, so they headed out, vowing to return in the evening after joining the twins for birthday drinks. The Adventurers had hoped to land a spot at Blue Bayou but no luck so they concluded the day at a nice outdoor cafe in Downtown Disney. This entry was posted in Family, Wider California adventures and tagged Disneyland. Bookmark the permalink. Good for you! Your adventures are much like ours 2 years ago here and in California Adventure! I was glad to go, but hoped I’d not be asked again! You and Dennis are really troopers!